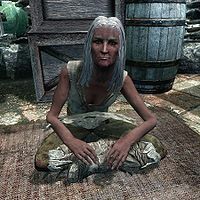 Edda wears a beggar outfit consisting of ragged robes and ragged boots. She wields an iron dagger in combat and also carries some lower-class items and gold. She may tell you that she is frustrated with her plights: "No one cares about us! No one! We could die and no one would ever know! They'd just throw our corpses in the canal. ", "I can't take this place anymore. The trees... all the colors, but the city, so dark. Why? It makes no sense. ", or "So cold, so hungry, so tired." She may also ask, "Are you scared of death? I am. I hear everything just stops... forever. It just all goes away, but you don't realize it. I don't want to die." or beg for some money: "Please, please. I need but a septim. A septim is all I ask. Is that so bad?" "Edda, you know well I barely have any coin to call my own. I'm sorry." "You must be starving. Here, spend it well." "All right, all right. Here." "Yes, I hope this helps." "Yes, of course. This war is causing your woes, it's hardly your fault." "Are you joking? Go earn a living and stop loafing!" "I would if I could, but I can barely make ends meet." "Of course, here. Be well." "Maybe you should look for work instead of begging for coin." "Oh you poor thing! Come by the temple and my husband and I will keep you fed." "Edda, Edda. There's no need for this. Just come by the temple and we'll care for you." "Sorry, all out of coin." "I've told you before, and I'll tell you again. Leave me alone." "Ugh, you reek. Get out of my way." "Oh, very well. Just try and clean yourself up." "Get away from me, you filthy woman." Esta página foi modificada pela última vez à(s) 20h37min de 20 de abril de 2014.